Multidophilus Three Billion from Solaray is a probiotic supplement for digestive health that can be taken daily for optimal support. 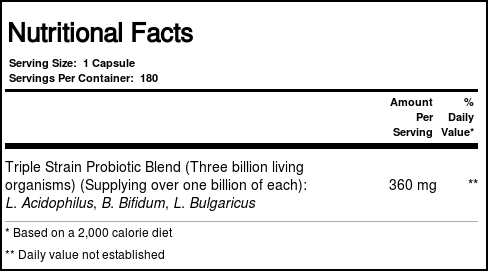 Solaray's Multidophilus Three Billion contains live mircoorganisms found naturally in the large and small intestines. These "good" bacteria help to regulate the amount of "bad" bacteria in the gut. This balance guarantees proper digestion of food for nutrient utilization and reduces symptoms of indigestion such as bloating, diarrhea and constipation. Probiotic supplements, like this one from Solaray, also support a healthy immune system. The ingredients and microorganisms included in Multidophilus Three Billion from Solaray have been freeze-dried for greater potency. Try it today at eVitamins! Recommended Use: Take one capsule up to three times daily with a meal or a glass of water. The customer reviews posted below are based on individual consumer experiences and may NOT necessarily represent what expected results will be from using or taking Solaray Multidophilus - 180 Capsules. These results may not be typical and you should not necessarily expect to receive the same results. Actual results may vary. All liked it. Drank with her husband on the recommendation of a doctor. BAA restores normal microflora, not only in the intestines. Only need to store in the refrigerator, as it turned out. I will order more. The doctor recommended, namely, with 3 components, although the site is and with a large number.